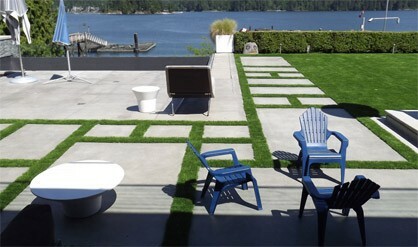 Own your own Vancouver artificial grass lawn, and enjoy practically no yard maintenance, ever! Sick of working endlessly on the lawn and still not having that fantastic appeal? Yard work is not only strenuous, but time consuming, leaving you with no time left to just enjoy your yard. What if I told you, you can achieve that dream like yard with no more headaches? Stop putting in that that back breaking work and switch to Precision Greens artificial grass. We can give you the look and feel of a natural lawn, with none of the up keep or problems. With over 3000 artificial grasses and 1100 golf greens installed, we pride ourselves on giving every property a superior look and finish. While delivering top of the line artificial grasses and exceeding customer expectations, we continue to lead the industry for over 17 years. Here is how we can give you the best yard in Vancouver. Variety: With a perfect selection of uniquely designed artificial grass, we can give any home owner a spectacular look and build a golf green even pro’s would want to use. Realistic: The innovative and inventive U-Shape and Wave Blade technology create a version of artificial grass that is realistic and life like down to the smallest of details. Leaving the line between artificial and non-artificial forever blurred. Design: Our products are designed to last, made of a strong material, they are able to endure the most intense of weather. Snow and pouring rain will just drain through the grass into the ground, while a UV protection prevents harsh sun from ruining the colour of your lawn. This means your lawn is never at the mercy of the weather. Safe: Our grasses have been tested and proven environmentally friendly and are meant for the whole family to enjoy. Being safe and user friendly, they also come made with a non-flammable material, so even in dry conditions, your yard remains worry free. Comfort and Ease: Easy to maintain and extremely comfortable, you will love not working on you lawn and taking credit for its magnificent look. Easy maintenance: Low maintenance is even too strong of a word, since the only task you’ll ever be required to do is simple cleaning. The grass structure itself will leave any debris or pet waste, high on the blades so you can quickly and easily remove it. Everything else washes away with a quick spray from a hose and your luscious rich look returns. Reassurance: For added peace of mind, all of our products come with a 10 year product warranty and a 3 year workmanship warranty. Get your artificial grass project started today by calling Precision Greens for your free quote.